While visiting my home town of Los Angeles, I passed a fairly well-known burger joint and noticed a sign/ad that was hanging in their window. 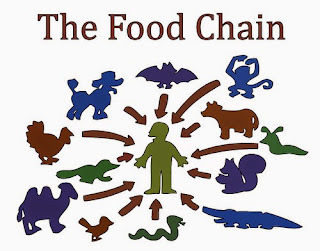 I can’t remember the exact wording, but it was something like “man did not claw his way to the top of the food chain to eat soy”. This is actually a fairly common argument against vegetarianism, though, as with pretty much every other argument that I’ve heard, one that's not difficult to refute. This argument falls apart on several different levels. First, it assumes that we are still cavemen. It assumes that we still walk around with spears in our hands, looking for animals to kill, less we die of hunger. We do not. We generally walk over to our local supermarket and buy meat that was killed for us. We choose to buy meat even though there are more and more tasty, healthy, ethical vegetarian and vegan choices right in front of us, often right in the same supermarket. This is a luxury cavemen didn’t have. This, my friends, is called evolution. For those of us who have accepted that it is time to evolve to a higher plane of empathy, eating meat can be clumped in with other behavior of our prehistoric ancestors that we now almost uniformly call “barbaric”. We, unlike our primitive brethren, have been given a choice – to move forward and to continue diminishing levels of violence in the world, or to continue our harmful dietary habits. I suggest we embrace the former in order to make the world a better place for both ourselves and the animals with whom we share it. But isn’t the fact that we have eaten meat for centuries, even millennia, a sign that this is, indeed, the natural way to eat? Once again, to the limited prehistoric man (and even to some of our more recent ancestors), meat was the most readily available form of sustenance, so it, indeed, seemed both natural and necessary. (That said, let's not forget that the above statement doesn’t even apply to all societies. Much of the Indian subcontinent, for example, has a very long history of vegetarianism, and there have been pockets of empathetic groups throughout history that have said no to the consumption of animals.) As I mentioned in the first paragraph, leaving behind harmful behavior is progress. Doing so helps us to become better people, to grow as human beings, and to pass on these new, positive, life-affirming values to future generations. We have already said no to many things that once seemed “natural”: slavery, child labor, certain blood sports, torture, and many others. Many of us have added animal suffering and the killing of animals to the list of things to eradicate, and not eating meat is a great step to take toward this end. It is important to contemplate how we are similar to other animals in order to grow our compassion and empathy. It is also important to realize how we are different, especially when it comes to our diets. 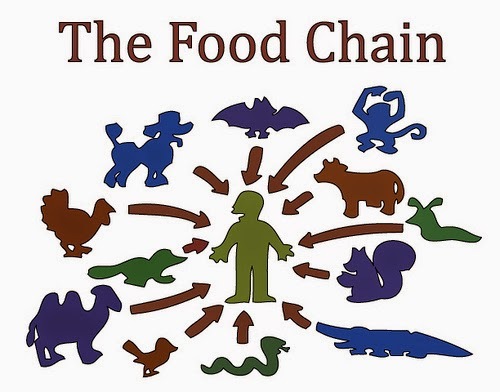 Carnivorous animals do not have a choice when they (kill and) eat their food. These animals are pretty much slaves to their instincts. In the wild, they have to be part of a food chain. A lion cannot go to a supermarket and buy an ethical plant-based product, instead of killing a gazelle. We can. The fact that we have this wonderful ability to choose a less harmful path is crucial, and we should not squander it in order to feed our bad habits. There are more and more people choosing a less violent path, and hopefully this trend will continue, despite short-sighted advertising campaigns. Can someone eat meat and still be a good person?